The September meeting will be canceled. I am being deployed on Monday night at 1800 hours. Some of our board members are being deployed at 1000 hours this morning with an unknown release time, up to (72) hours. I may not be back for a few days. (72) hours or more. I have been in contact with Rebecca. It is hard for her to shop for the dinner with stores being empty and the impending storm. We have 1 large can of green beans and 10 pounds of potatoes. I advised her not to buy in advance due to possible power outage. Our meat supplier may or may not be open as it depends on the water level at his business in conjunction with other factors that may play a part. (power, employees and structure). Although, I wanted to have a dinner, there are too many risk to our members. Too many unknown factors at this point. I do not feel comfortable in trying to put a dinner/meeting together with a pending hurricane, possible tornadoes, and down power lines which could put our members at risk. Take care of your home, take care of your family and neighbors. Please be safe as we ride this storm out. Please pass this on to your mail contacts. STAY HOME AND TAKE CARE OF YOUR PROPERTY, FAMILY AND FRIENDS…. 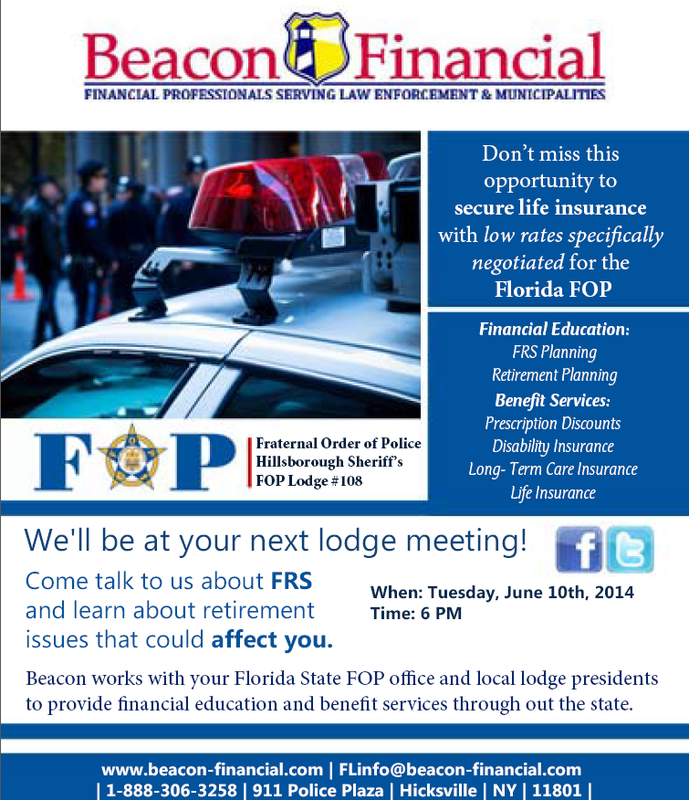 Please visit https://www.fop-benefits.com for the new added benefits that are available to you as a member. We try our best to continue and provide the best for our members. FRATERNAL ORDER OF POLICE ENDORSE TRUMP!!! Chuck Canterbury, National President of the Fraternal Order of Police, today announced the organization’s endorsement of Mr. Donald J. Trump for the office of President. 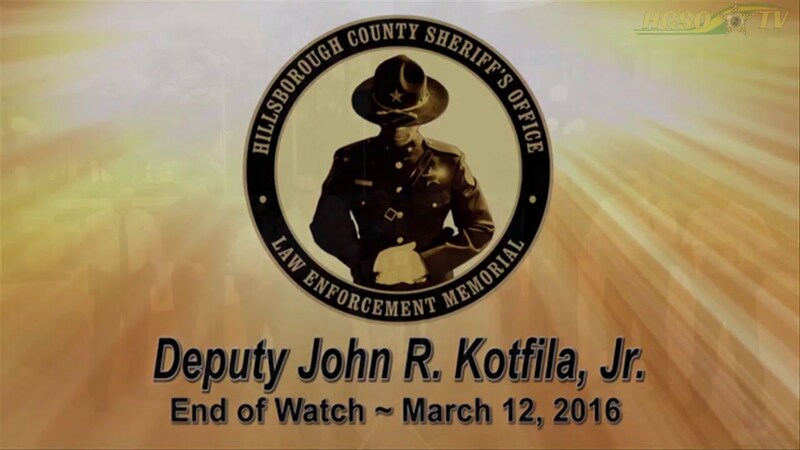 Death of Deputy John Kotfila Jr. Upon hearing of the tragic accident that claimed the life of Deputy John Kotfilia Jr. The lodge was contacted to provide any assistance that we could. Phone calls were made and we reached out to our members and contacts. The Florida State Lodge and District 3 lodges activated the disaster relief trailer to provide water at the funeral. The trailer was manned by members from Pasco, Polk, Tampa, Manatee and Pinellas counties. One of our contacts were able to contact OUTBACK and arranged to have 1,000 meals to be served after the funeral. SAMS CLUB was also contacted and provided water. The lodge worked in unison with Colonel J. R Burton to ensure everything was covered. The Florida State Lodge Chaplain came up from Miami with a F.O.P bible. President Preston, Chaplain Bello and I presented the bible to the Kotfila family. The F.O.P District 3 lodges presented a $1,000.00 check for in line of duty death benefit. Thanks for everyone’s assistance. The F.O.P did a great job. President Couey, 2nd Vice President Clamon and Treasurer Bordonaro attended the Florida State Lodge, Fraternal Order of Police Board of Directors Meeting in Orlando Florida. 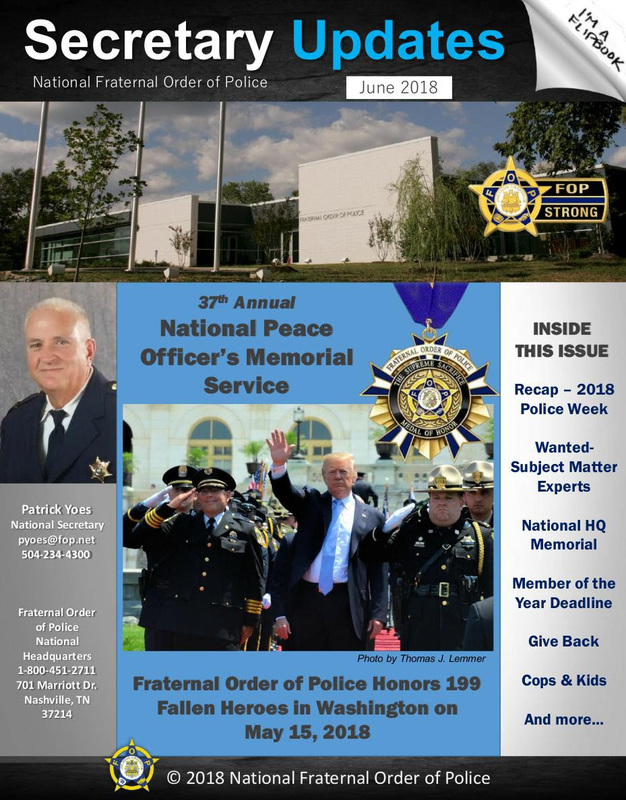 Fraternal Order of Police Lodge #108 had submitted a change in the current Constitution & By-Laws that was presented to the Constitution & By-Laws committee for review and was voted on and approved by the committee. On February 14, 2015, At the General Session, the Constitution & By-Laws for Fraternal Order of Police Lodge #108 were voted on and approved. As an added benefit to being a member of F.O.P Lodge #108, we have authorized Bright Now Dental to offer their discount dental service to the members and and their families. You will be receiving a brochure in the mail explaining what Bright Now Dental has to offer. When you receive the brochure, Bright Now Dental refers to offering dental services to union members for nearly 40 years and has wording in the brochure referring to you being a union member. This does not apply to F.O.P #108 as we are a Fraternal Lodge, but members can still receive the benefits. Bright Now Dental offers a reduced fee schedule that provides 40% savings from average cost on most procedures for all active and retired members and their immediate families. (F.O.P) and (F.O.P.A). 4:39 in to the video you will see Shelbie and Paul Blanchard Jr. The members of the Fl State Memorial committee work very hard to put this together and our lodge is always honored to be a integral working part of this committee. Please feel free to share this link with family and friends.